Pine Tree View.......NO rear neighbours. 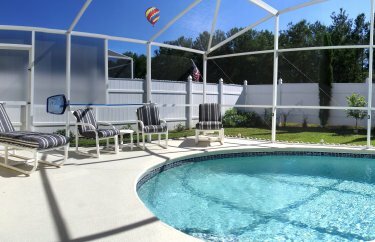 If you are looking for a superb Florida vacation rental home with screened private pool, overlooking a conservation area then look no further! Why stay in a costly hotel when you can enjoy the unashamed luxury and exclusivity of staying in our beautiful NON SMOKING vacation home at a fraction of the cost! Please NOTE, we also offer our Villa as a 5 Bedroom, for the larger families. See price lists. From only GBP 8.28 (USD 11.18) pppn (based on 10 guests, staying at least a week). FREE WiFi Broadband internet access - just bring your own PC, Phone etc. FREE use of a SAFE, for the storage of your valuables during your stay. 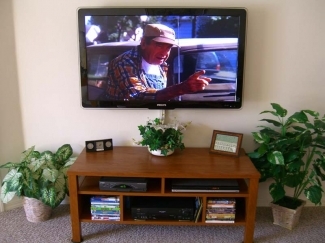 43" HIGH DEFINITION SMART LCD TV, with HD channels. DVD Player - Radio CD/Cassette Player. SOUTH FACING HEATED* PRIVATE SWIMMING POOL. TRANQUIL VIEWS OVER PINE FOREST FROM THE POOL AREA. Mattresses have "Pillow Top" and "Memory Foam" toppings. 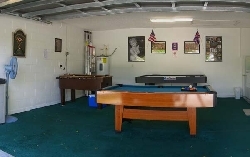 Games Room with - 7' Pool Table, Foosball & 7' Air Hockey. 2 LARGE BEDROOMS one En-suite bathroom. 3 other good sized bedrooms. GOLF COURSES GALORE CLOSE BY. 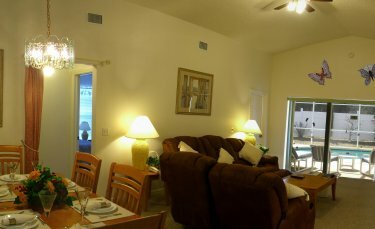 "CHRISTMAS & NEW YEAR" --- MINIMUM 9 nights rental. Prices are FULLY INCLUSIVE of ALL services and TAX's. There are NO extras to pay, except pool heating if required. * Pool heating extra at a MAXIMUM of ONLY - - GBP 80(USD 110)/W - reducing in summer months. ** Minor restrictions apply. See our web site for details. Starter Food Packs also available from USD 75 delivered to the Villa ready for your arrival. Payment can be made with a 'Personal Cheque' or 'Bill Pay', EFT. Dates are approximate, slight variations are allowed without penalty (lower Rate MAY apply).